Aircraft Toilet Water Heater Assembly. Familiarisation with the aircraft toilet water heaters, their operation and isolation in an emergency is an important part of crew training. These aircraft heaters feature the original amber indicator light and isolation switch used in standard training and can be used as a standalone item or included in one of our crew recurrent training cabin simulation systems. This aircraft toilet water heater assembly is supplied as un-certified representative training equipment. 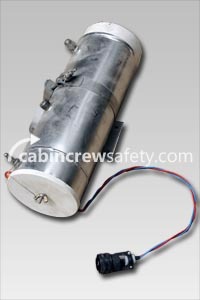 Looking for a Aircraft Toilet Water Heater Assembly for flight operations end use? We're here to help with all of your equipment needs. Not only with this Aircraft Toilet Water Heater Assembly but any other parts, equipment and reference training devices that you may require.